Got Birds in your Dryer Vents? My wife and I, like millions of other households in the U.S. have a bird feeder in the back yard. It’s a relaxing “sport” during the evenings, or the rare occasion when we have time to have coffee on the patio in the morning. The feeder attracts regulars like Cardinals, Red headed House Finches, and Doves. We occasionally get some migratory birds like the Red Headed Grosbeak. Since my wife and I aren’t professional “birders” we occasionally have difficulty identifying our visitors. While we have intentionally set up a place to attract birds for our entertainment and relaxation, there are situations that our feathered friends create that are not conducive to the aforementioned activities. Have you walked your neighborhood recently? 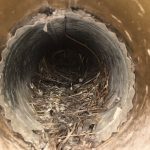 If you have, you may or may not have noticed that birds have made nests in the bathroom vents on the side of the homes and possibly under the soffit. Many times, they will have nested in the dryer vents. So, the next time you’re out, take a look! 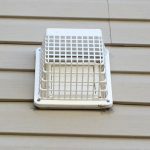 The most frequently asked question I get is, “how do they get in there?” The situations vary, the screens deteriorate and fall off, screens were never installed, or you will see the birds lift the flaps on the vent and make their way in. The culprit in my experience is usually the European/Common Starling https://www.audubon.org/field-guide/bird/european-starling. Once established they will continue to fill the vent with nesting material and have multiple broods. This prevents the moist bathroom air from being vented properly. They can also perforate the plastic vent line and get into your attic or between the floors of your home. They tend to leave a lot of droppings behind and many of them are infested with “mites.” Trust me, it’s not a pretty site when mites start pouring in through your bathroom vent. It’s important to be proactive and protect your home with proper bird guards to prevent access. If you already have birds nesting, it’s important to get the nest removed as quickly as possible before they can lay eggs and hatch their brood. At MJL Services LLC we can resolve these issues for you. Nest removal, bird guard installation, and repair or replacement of vent covers. A little proactive action will help prevent more costly repairs and pest treatment in the future.